The California Dream is losing its steam, in part because of Proposition 13. 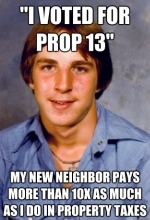 Proposition 13 was part of a “voter revolt” in the 1970s against high property taxes that fed a bloated government. It changed how property values were assessed, it lowered homeowners’ taxes, and was so popular it is now considered the “third rail” of California politics — you DON’T TOUCH IT. But almost 40 years after it was passed, it’s time we reformed it, in light of the problems California faces today. I floated an earlier version of this blog post to get feedback. This is a hot topic! At the same time, writing about hot topics is why I created the blog. And few people disagree with the problems I list -- it's the solutions I propose that will create the biggest discussion! 1) The middle and working class are leaving California because they can’t buy homes. 2) Too many older owners aren’t selling, so whole regions are “greying” and stagnating. 3) Families buy affordable homes too far from work, creating more traffic problems. 4) The prices of homes are rising again, but only the wealthy are buying, to either flip or rent. 5) Owners tear down older historic homes and build McMansions. 6) The money the state gets from property taxes is out-of-whack, with some paying far too little and others, who can’t afford it, paying far too much, which is unfair. To be clear, Proposition 13 did not cause the problems I listed, but it is making them worse. Updating the law would help solve them. Before Proposition 13, property taxes were based on the assessed value of the home, so as the value of the home increased, so did its property taxes. This frustrated many California homeowners, including my father. Assessors seemed to raise property values haphazardly or assessed homes at higher values each and every year, just to increase tax dollars for the state. Homeowners who improved their properties were punished with higher taxes simply because they had made their homes more appealing. Proposition 13 ensured that property taxes would be based on the sale price of the home, not the assessed value, with a two percent increase in the assessed value of the home added each year. At the time, it felt fair. However, four decades later, this means the quaint beach home that Bob and Joanie bought for $133,000 in 1974 pays property tax based on home that’s now valued at $200,000, even though the home is worth 2 million now. Bob and Joanie pay around $4,000 a year in property taxes. If they sold their home for 2 million however, the new couple buying that quaint home could pay close to $40,000 a year in property taxes. It makes some people never want to buy, and others to never want to sell. Let’s examine each problem I listed, and how changing Proposition 13 will help. The Middle and Working Class are Leaving, because they can’t buy a home. To buy a little dumpy house in Southern California, we would have to pay well over $500,000, in a not so good neighborhood. It would be 1000 square feet, with no yard, and we’d then owe over $8,000 a year in taxes. It just isn't worth it. We have friends here who paid $750,000 for a house smaller than our apartment with no yard, in the hood, where their fence is constantly getting tagged my gangs. They both have to work year round, and barely make ends meet. In Ohio, we are looking at a 2500 square foot house (not counting the basement) on 8700 square feet of land for $169,000. For some, it is worth it to pay the high dollar for 355 days of sunshine, but the weather is no longer the deal breaker — raising a family is. So they are moving back to the Midwest, The life in Ohio is just better if you’re a young educated middle-class family buying a home for the first time. In other words, the dream for them is no longer in California — it’s is elsewhere. And they’re not the only ones. For the first time since World War II, more people are leaving the state than coming. That may not seem like such a bad statistic at first, but it’s people like Terri and Nathan who are leaving, which is terrible for the economy in the long run. Many are people who came to go to school here, blossomed in careers here, and now — after California has invested in their education and training — other states will benefit from their expertise, earning power and long term investments. But what if the taxes in California were different? If Joanie and Bob in the 2 million dollar house had to pay MORE for their property taxes for their MORE valuable home, they might look at their house and consider moving to a smaller home that was assessed at a LOWER value, with lower taxes, and enjoy the profits of their home sale. But if they sold right now, they’d have to buy the $500,000 dump that Terri can’t afford, and get hit with the higher taxes along with it, so they stay where they are. It’s a smaller older home, perfect for Terri and Nathan, but those homes aren’t for sale. The problem is self-perpetuating — the less the supply of affordable homes, the higher the demand, and prices go up. The older couple stays put and the middle class continues to leave. Therefore, we need to assess and tax property differently, to increase home sales, which would increase the supply of homes on the market, and lower the price. But — no one wants their home assessed at a lesser value, or to lose value in their home in a wealthy buyers market, and no one wants to pay higher taxes on that home. That’s why Prop 13 is the “third rail” of politics. It’s too shocking an idea to even discuss. But hey, let's discuss! I think we need to give first-time home buyers like Terri and Nathan a complete tax break on their first two years in their new house, and then institute their high property tax gradually, in 20% increments (this is a number I grabbed out of the sky, I admit). I think we should give the same break to current California homeowners who want to change their primary California residence, like Bob and Joanie, who many want to downsize. The state often gives “first time” tax break incentives; for many years they waived the $800 annual corporation tax for new corporations in California, to stimulate new business formation. This would gradually generate more sales, and gradually increase the number of homes on the market, and lower the sales price of homes in a fair and predictable way. Then couples like Terri and Nathan would be paying for a less expensive home with lower taxes, and help Joanie and Bob to downsize and live off some of that equity locked in their valuable home. But at what cost? How do we pay for it? We either raise taxes, cut costs, or...do nothing. And I plan to address THIS THIRD RAIL in another blog post -- my ideas will either pique your interest, or poke you in a sore spot, but it's time to discuss this issue. Next week's blog post will be more problems, and more solutions -- yet still dodging the bill. The final week of this three part series I'll throw out some ideas on how to pay for it all -- and who picks up the tab -- so stick around to be either entertained or enraged. Good News for a Change!